Luzonia "Lydia" Tolentino Bernardo, 72 years old of Lihue, Kauai, passed away on November 8, 2016 at Garden Island Health Care. 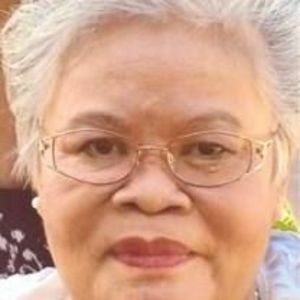 Born on October 30, 1944 in San Mateo, Isabela Philippines, she retired from Hilton Hotel. Preceded in death by her parents, Mamerto & Laurencia Tolentino; brothers, Cardenio Sr., & Narcisco Tolentino; sons, Isidro Jr. and Renato Bernardo. Survived by her husband Isidro Bernardo; daughters, Merly (Johnathan) Fatu, Sr., Juliet (Kevin Jones) Ruiz, and Jeanie (Chris) Tavares; sons, Alex (Olivia Bernardo and Bernard (Tisha) Bernardo; sisters, Rosenda (Dominador) Tumamao, Virginia (Carlos) Bernardo, Remy (Machael) Inouye, Linda (Resty) Bernardo, and Francesca (John Paul) Taylor; brothers, Dominador (Medina) Tolentino, Mamerto (Helen) Tolentino, Danilo Tolentino and Juanito (Cathy) Tolentino; numerous grandchildren, great-grandchildren, nieces, nephews, cousins & friends. Friends may visit with the family on Saturday November 19, 2016 at Borthwick Kauai Mortuary Chapel in Koloa from 9:00AM to 10:15AM where services will be celebrated at 10:30AM. Burial to follow at Lihue Cemetery.